Who wouldn’t want a loveable T-Rex shining away in their room? Takes a 60-watt bulb. 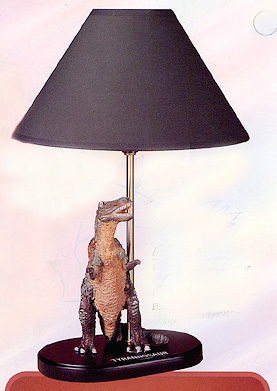 The lamp is about 15″ tall and says “Tyrannosaur” on the base. NOTE: The lampshade is a deep forest green and the base is a dark brown walnut stain. Tags: lamp, light, walnut, decor, room.